If you’ve ever driven past Wolf Ledges Parkway, you probably didn’t notice the Wolf Ledges building. The drab exterior camouflaged the wonderful work of Community Support Services, which helps clients with mental health issues. But if you drive past it now, you’ll see bold, bright colors and an inspiration quote by Emily Dickinson. The University of Akron’s Art Bomb Brigade has collaborated with Community Support Services to raise awareness for mental health and provide a brighter place for CSS’s clients. 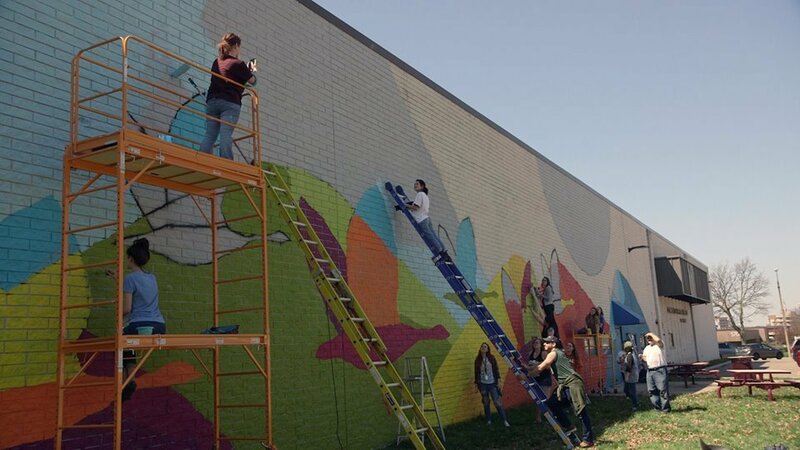 “They originally only wanted a mural because they had some buildings on Wolf Ledges that were sort of unrecognizable and they were coming up on their 30th anniversary,” says University of Akron professor Elisa Gargarella. Art Bomb Brigade was launched in 2016 by UA professors Elisa Gargarella and Marisa McClellan. Since its launch, Art Bomb has done eight murals around Akron. Before the creation of Art Bomb, Gargarella had Arts LIFT. The program has been running for almost 17 years and is for high schools students to work with local artists and make public art in the community every summer. Gargarella decided to start Art Bomb because there wasn’t a program similar to Arts LIFT for college students. She also came to realize the power public art had in enhancing a community. It also gives young people an opportunity to make a lasting impact. Art Bomb has done eight murals around Akron. However, this is the first time they’ve had a partner actively participate in the creation of a mural. Executive Director of ARTS NOW Nicole Mullet connected Art Bomb with faculty members of CSS’s art therapy program. After meeting with one of the art therapists, Gargarella and McClellan thought it would be an interesting and exciting opportunity for Art Bomb to work with the art therapy group to co-design and implement a mural that embodied the spirit of CSS and its mission. “Art Bomb really embraced the idea of participatory design and client and student engagement through that whole process,” Gargarella said. The project took a total of five months for the team of 20 clients and students to complete. Art Bomb and CSS’s clients have transformed the Wolf Ledges building and made it into something more inviting. Emily Dickinson’s line “Hope is the Thing with Feathers” embodies the work of CSS and there’s paintings of geese to represent the geese that are always around the building. Mark Percival, a client of CSS, enjoyed participating in the project. Join Art Bomb Brigade and CSS on Wednesday, May 23 from 5-7pm to celebrate the mural at CSS.